Amazing Balinese feast. (Clockwise from left to right) – Chicken in coconut curry, chicken satay, deep fried tempe in sweet soy sauce, gado gado, coconut and snake bean salad, rice. Well it’s been a while since I’ve a.) cooked very much and b.) blogged about it. The build up to Christmas was super-busy, then we went on an amazing holiday to Bali, Indonesia in the New Year, and returned to our house for a couple of nights before moving out again while it has been painted from top to toe. So the kids and I have been hanging out at the beach with various family and I either haven’t had to cook or kept it simple. But I have very itchy cooking feet and can’t wait to get back to slaving over a hot stove! I’ve got some super exciting plans for 2013 that have been keeping me busy that I can’t wait to share in the coming weeks. 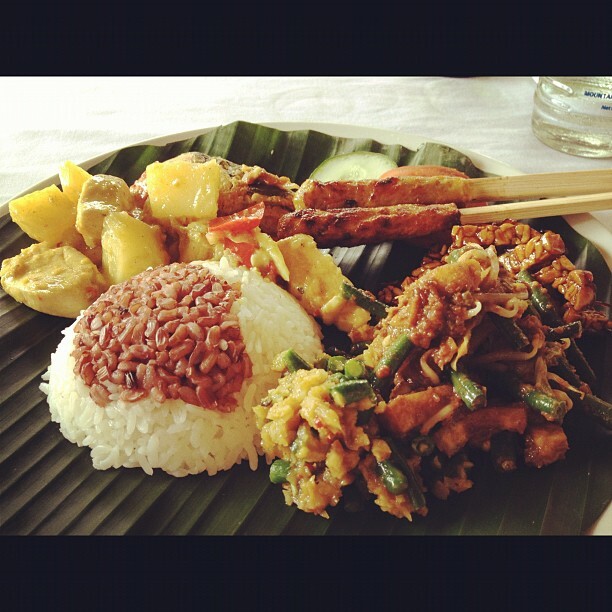 In the meantime I’m going to share some yummy Indonesian/Balinese recipes from our lovely trip. 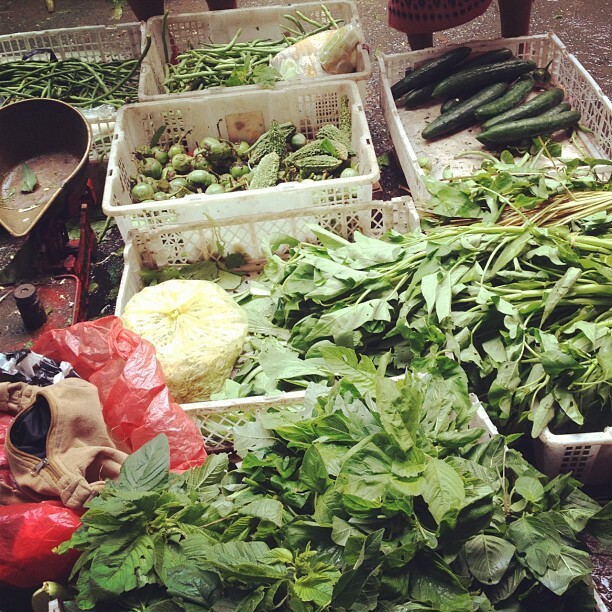 We spent a day at the Paon Bali Cooking School in Ubud, Bali. If you ever go there, I would highly recommend taking a class. The day began with a trip to the local market where we saw all the amazing vegetables, fruits and spices – and avoided the smelly meat-sitting-in-30+ degree-heat section! 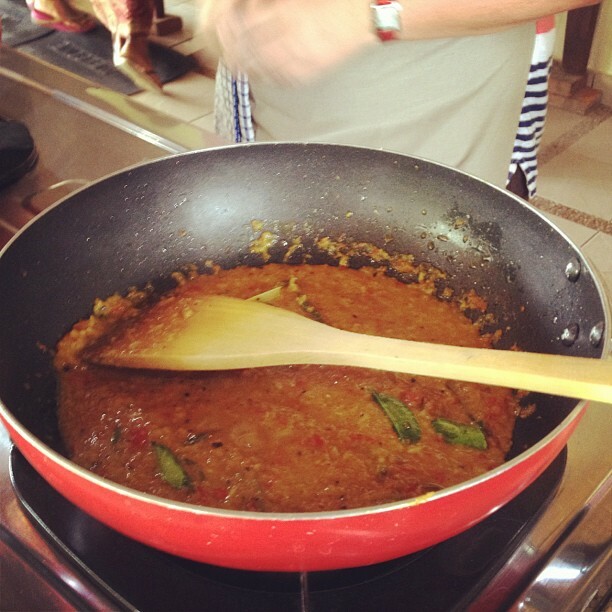 We then went to the cooking school and cooked 8 different dishes that we devoured over lunch. The basis for a lot of these dishes is Base Gede Bumbu Kuning (Basic Yellow Sauce). 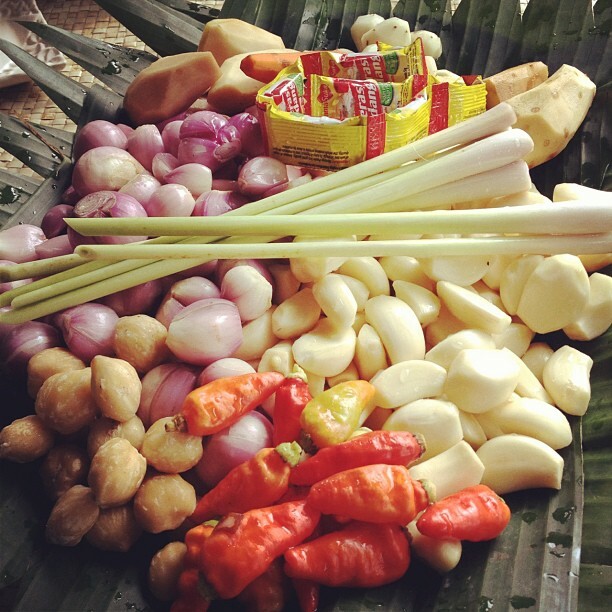 From this you can make a variety of curry, satay and other delicious dishes. 1. Slice and remove seeds from the chillis. Finely chop shallots, garlic, galangal, ginger, tumeric, candle nuts and chillis. 2. 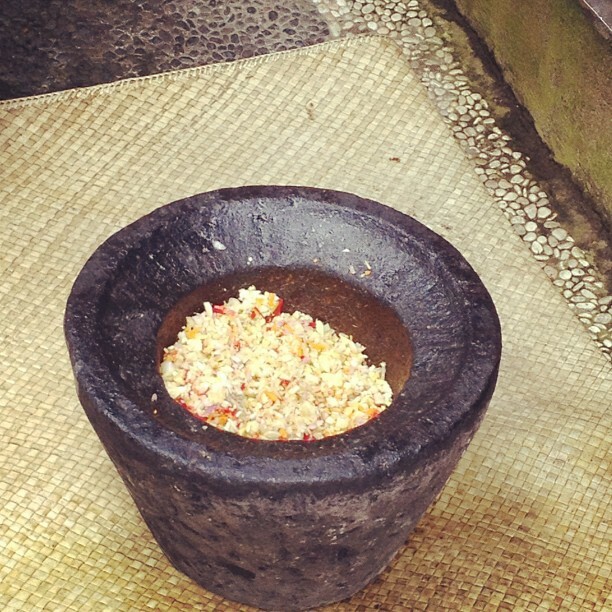 Blend the chopped ingredients, coriander seeds, nutmeg and cloves in a Balinese lesung (giant mortar and pestle!) or in a conventional blender until they form a fine paste. The ingredients sitting in the giant lesung or mortar and pestle. 3. Saute the paste in the coconut oil. Crush the lemongrass stalk then add salt, pepper, palm sugar, bay leaves and the lemon grass to the paste. Saute for about seven minutes on a low heat. 4. This basic sauce lasts for 1-2 weeks in the refrigerator.